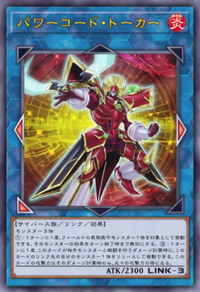 Main card page: "Powercode Talker"
Once per turn: You can target 1 face-up monster on the field; negate that target's effects until the end of this turn. Once per turn, if this card battles an opponent's monster, during damage calculation (Quick Effect): You can Tribute 1 monster this card points to; this card's ATK becomes double its original ATK during that damage calculation only. This page was last edited on 23 September 2018, at 15:02.